U.S. 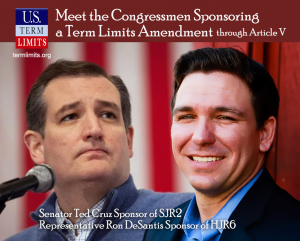 Term Limits (USTL), the leader in the national movement to limit terms for politicians, today called on Congress to pass the Cruz-DeSantis resolution for a congressional term limits amendment. The resolution matches President-Elect Trump’s proposed limits of three terms in the House and two terms in the Senate. According to national polls, congressional term limits is the most popular and bipartisan political issue in the United States. A 2016 Rasmussen survey found that 74 percent of Americans favor the amendment, while just 13 percent are opposed. Overall, 77 percent of Republicans, 67 percent of Democrats and 79 percent of independents favor term limits. The amendment has been introduced in the U.S. Senate by Senator Ted Cruz (SJR2) and in the House of Representatives by Representative Ron DeSantis (HJR6). Forty-six additional members of the House and Senate have already signed pledges committing exclusively to the Cruz-DeSantis resolution. It requires a two-thirds majority vote from both chambers to be sent back to the states, where approval from 38 states is required to ratify it into the Constitution.